720p shuttered at 1/1000th made every frame of high-speed action crystal clear. When computers began replicating and replacing expensive electro-mechanical broadcast TV production and playback systems, the gravy train ended for some and started for others. 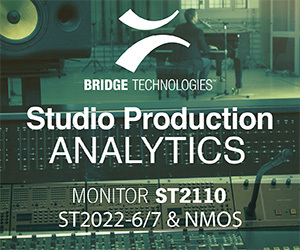 Affordable digital TV production gear has slashed the ante for producers and is making mountains of television content with high technical integrity available for everyone. The Apple iPhone 6 records 1080/60p video and captures nearly all the pixels, depth and frame rate only big budgets could afford a decade ago. It also stores clips in the cloud and streams live, which was a crazy dream a decade ago. Digital broadcast gear keeps trending towards more power to make better pictures in more exciting ways at significantly lower costs. What’s not to like if you’re starting out? Not long ago, the cost of HDTV production was sky-high. Some early adaptors are still paying for it. Today, knowledgeable producers with ideas as big as their budgets are small can perform all kinds of exciting HDTV feats for relative pocket change. Some say affordable production gear is the death of broadcasting. Others call it a new beginning. To paraphrase American author Mark Twain, reports of the death of over-the-air television broadcasting have been greatly exaggerated. A virtual sports production truck and TV stage filled the living room of this 3 bedroom rental vacation cabin. The chroma key set is behind the monitors to the left. Talent observed all cameras simultaneously on a floor monitor showing the TriCaster multiview output. Historically, it took $100,000s of gear to produce and record "broadcast-quality" TV images. Today's gear takes and makes exponentially better pictures at fractional costs and its nearly all "broadcast quality" or better. Fifty years ago nothing was better than "broadcast quality" and a one-hour reel of 2" quad color videotape cost several hundred dollars. Adjusted for inflation, that money today could buy a decent HDTV camera with more than an hour of memory. High-turnover volume in the mainstream smartphone and video camera market empowers the drive for new technology from top to bottom. More of it continues to spill into the professional market and its economy of scale makes TV less expensive to shoot, edit and distribute. The 21st century has seen the extinction of low-end video. DVRs, flat screens and smartphones have already pushed most VHS camcorders, VCRs and CRTs to the recyclers. A rising tide, as politicians like to say, lifts all boats. TV's rising technology tide not only is lifting all boats but changing the waterfront landscape for viewers, producers and equipment manufacturers. Nearly anyone can capture great images. Creating quality content that attracts an audience, maintains viewer attention and makes money is far more complicated. It’s also the universal master key to media success. 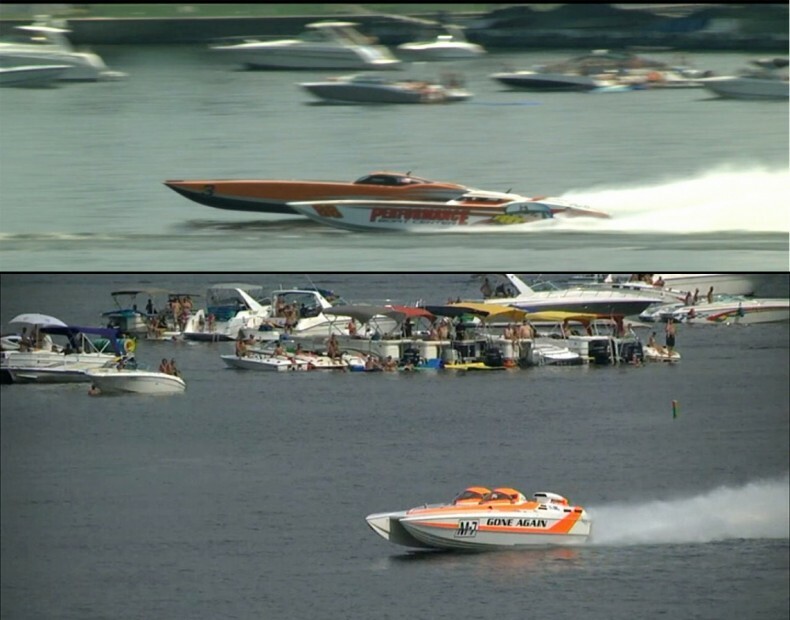 Viper Communications in Osage Beach MO produces, and its TV station partners broadcast live high-speed offshore powerboat races, generally originating from the middle of nowhere. We’re not a 53’ sports production truck, but we play one on TV. We backhaul to stations via LiveU units over the Internet and stream to Ustream with a Matrox Monarch HD. Live TV content is created by integrating incredibly affordable new video solutions with a world-class radio broadcast. Judging from ratings and comments from viewers and sponsors, it’s working. The LiveU LU500 supports SDI and HDMI inputs from cameras, switchers and editors. LiveU devices were set up to feed a fiber Internet connection and ignore cellular connections to backhaul the program to FOX affiliates in Springfield and Columbia MO. For maximum picture quality a 10 second delay was set in the LiveU, and the studio clock was set ahead 10 seconds to compensate. There are two categories of TV production gear buyers. One buys tools. The other makes bets. A tool does what it was purchased to do reliably for as long as possible. Tool buyers usually get their spending money from an annual capex budget. Typical tool buyers are schools, governments, cable and broadcasters. The return on investment is that they can competitively and consistently deliver market-satisfying content without interruption. The other category bets on future income. Bettors generally aren’t schools or TV stations billing clients 24/7. Most bettors are independent. Some lease, some borrow, some pay out-of-pocket, and all are betting on the future. Betting demands time to thoroughly investigate and carefully shop. A bet may seem to be on new gear doing a better job, but the real bet is on whether the new gear will pay for itself with a profit before obsolescence. Bettors need a business plan. The more powerful and feature-laden production gear gets, the less it often costs. New features and settings in today’s gear outpace most printed or online documentation. Curious engineers with time to explore and experiment with new equipment may discover unconsidered ideas, unintended solutions and hidden pitfalls, often within seemingly generic menu trees. The Ensemble Designs router provided some welcome magic. 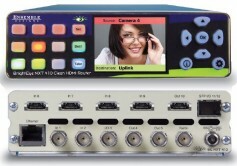 For example, our new Ensemble Designs NXT 410 router also converts HD-SDI to HDMI or vice versa. That’s not what we bought it for, but that ability resolved some surprise SDI source issues that first appeared to need to brick converters overnighted in to work. The SDI challenge was fixed so fast there wasn't even time to panic. Exploration is how some curious engineers deliver miracles. On the other hand, exploring the unknown is about the last thing engineers want to do when gear is on air or supposed to be. A GoPro shows the view over the transom of Miss Geico racing at over 160 MPH. Note the competing powerboat on the left. The competitor later cut inside a course buoy and was disqualified, thanks to the on-board GoPro video. Before Viper’s latest powerboat racing production went live, there was time to experiment, learn and benefit from updates and upgrades and find some gems buried in submenus and operating panels. We needed to test and experiment because in the three months since we bought our gear, it was all digitally upgraded. In every case very good got even better. With the latest NewTek TriCaster Advanced Edition (AE) software upgrade (v 3-0-150827), we didn’t miss a single frame of imported video files. Some of the additional 60+ operator-centric capabilities in the new AE version were unexpected new tools that became useful almost immediately. One ongoing production challenge was the mix of high-speed action, part-time camera operators and rental cameras. The rented Panasonic AC160PJ cameras always looked great until the action started. Pictures and freeze frames of race boats traveling 100+ MPH speeds were often disappointingly blurry. We were blaming the blur on camera-to-studio backhaul, and thinking the cameras weren’t designed for super-slomo. Our tight budget lowered expectations. Top photo is 720p with no shutter. Bottom photo is the same rapid camera/subject movement at 720p, shuttered at 1/1000th. Note how the shutter sharply improved clarity of the boats and backgrounds. 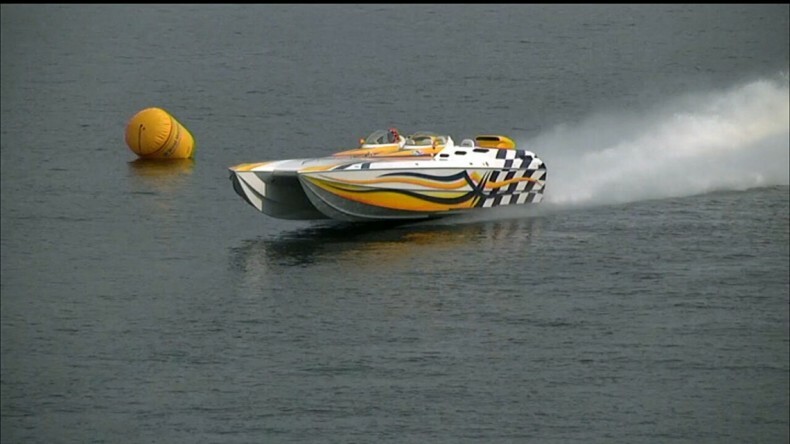 We’ve all seen generic shuttered hummingbird wings slomos, but hadn’t connected the idea with blurry full-throttle 3000 horsepower race boats. We'd hacked through nearly all the camera/encoder/decoder and all the Wi-Fi TX/RX settings in an attempt to identify what was restricting out video quality. We tried the shutter button, but on average days when most boats are pulling tubes or skiers and traveling under 35 MPH, the shutter didn't make much difference. When 100 MPH+ racing starts, we're too busy to experiment. An engineer friend suggested dialing in a 1/1000th shutter. The shutter was essentially a substitute for ND that provided a higher F-stop for better depth-of-field focus. It wasn’t actual overcranked, interpolated super-slomo, but it resolved several critical optical issues before the light hit the camera sensors at no cost. Nearly every shuttered 720p camera frame was a perfect still photograph. Without the masking benefits of blur, a keen eye might perceive what looked like a slight jitter in some live shuttered movement. Shooting at 1/1000th can do that. It was a subtle trade-off, worth it because of the vastly improved high-speed subject clarity. Speed was the theme and shuttered freeze frames made the visuals great and the slomos spectacular. 1/1000th is unnatural for some scenes, but it worked perfectly on the race course for us. Even at top speeds, the shutter kept boats and finish line buoys in sharp focus. Having resolved the camera image quality issue, the backhaul system was nearly off the hook, except for some random digital glitches at the studio. The Matrox Maevex encoders and decoders all got firmware upgrades which were said to improve picture quality. We were encouraged. The pictures may have improved, but we still got hits (or glitches). Some hits could be attributed to ducks, geese or tourists. Others were unknown. Any “hit’ would take a minute or more for the entire system to recover. For about 2 minutes (about 0.003% of the 16 hour broadcast), we had to "fake it” to cover the loss of a critical start or finish line camera, both more than a mile away. Fortunately, we never lost both cameras simultaneously. Cameras in both Wi-Fi bands took a similar small number of hits at different random times. The Ubiquiti Wi-Fi systems were set to 20Mb/s/camera. The Matrox encoders were set for 15Mb/s/camera. Hiccups were occasional and random. System bandwidth was constantly monitored and infrequently dropped below target levels momentarily. Overall, the systems and settings provided the HDTV quality many would consider standard for major network live sports coverage. There were some bad frames but they were few and far between. I've seen more frame hiccups in major network golf tournaments. It was our first deployment of a 5.2GHz Wi-Fi system at this venue. A huge population of 5.2GHz radios popped up on the spectrum analyzer. We weren’t too surprised, as our antenna pointed towards hundreds of condos across the lake not connected to any cable or DSL, all getting Internet service via Wi-Fi systems and repeaters. There wasn’t enough reliable 5.2GHz bandwidth for two cameras. Fortunately, we were able to borrow a 900MHz Wi-Fi radio system from a friend that gave us the ability to keep both wireless cameras streaming IP video at 15Mb/s each, all day. Matrox PowerStream software confirmed encoding and decoding at 15Mb/s or better at each point. The 900 MHz backhaul is on the left, 5GHz at right. As defined by the Wi-Fi Alliance who has trademarked the words "Wi-Fi," Wi-Fi is any wireless local area network (WLAN) product based on the Institute of Electrical and Electronics Engineers' (IEEE) 802.11 standards. IEEE 802.11 covers the 2.4, 3.6, 5, and 60 GHz bands. Most computers, smart phones and wireless routers operate in the 2.4 or 5GHz bands or both (IEEE 802.11n, known as Dual Band). The 2.4 GHz band is free to use worldwide, but is extremely crowded with interference from other wireless devices and even some microwave ovens. 2.4GHz only allows for three 20MHz channels without an overlap, channels 1, 6 and 11. There's all kinds of activity on the 2.4 MHz license-free band that can destroy broadcast video back-hauls. Hello baby monitors, good by live shots. The 5 GHz band is free to use worldwide and growing in popularity. It resides in what’s known as C-Band (4-8 GHz), used by some satellites and weather radars. 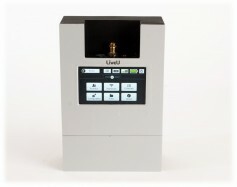 It provides a wide spectrum and works well for long-distance, line-of-sight links. But, 5 GHz signals don’t pass well through obstacles. Lower frequencies usually do better. 5GHz band channels are 5MHz wide and every 4th channel is usable. Bonding multiplies bandwidth. The reason for the gaps is for adequate spacing to prevent channel overlap. Its well suited for video backhaul and everyone's moving to 5 MHz. It isn't that reliable and it won't last that long. But, it's here and available right now and not expensive. The 3 or 3.65 GHz band is noise-free in most areas, but requires a license. There may be additional restrictions on its use depending on local regulations. The 900 MHz band works like Wi-Fi but is considered “Fixed Wireless.” It is likely to require a license in some parts of the world. It has a higher tolerance for line-of-sight obstacles but noise levels are typically higher. Viper Communications will be using a new 900 MHz system for camera backhaul at the OPA World Championships in November. Stay tuned for that report. 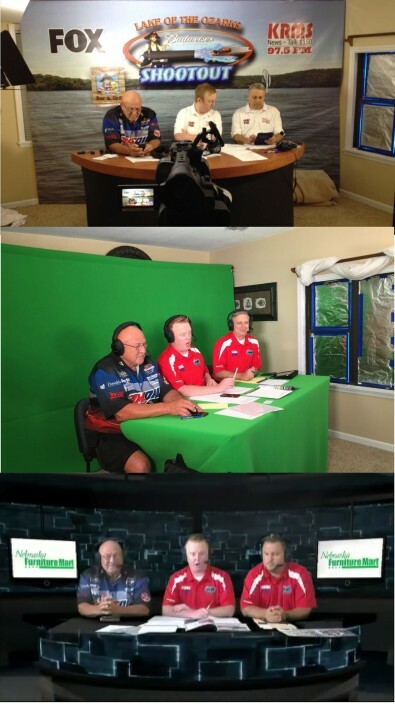 Last year's studio set with backdrop (top), now a chroma key set, as seen on TV (bottom). Another brand new challenge was using a virtual set for the first time, in a very tight space. 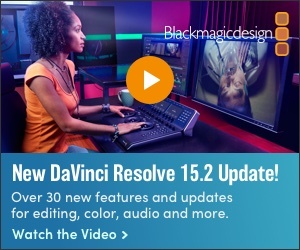 A big shiny printed logo-filled banner backdrop was replaced with a NewTek TriCaster virtual set. The tight space and low ceiling made us break all the rules for chroma key set lighting. Thanks to green foam material from Chroma-key.com and the wide range of TriCaster controls, against all odds it worked and it looked fine on the big screen. It even looked good on an outside mobile Jumbotron hired for the crowd at the docks to watch. Flexible LED lighting and the TriCaster’s chroma key controls provided the necessary versatility to make the virtual set work virtually out of the box. We couldn’t access the room we used for the studio until three days before the event. None of the talent would be present until the day of the show and none had ever been on a chroma key set. We didn’t know how the chroma key set would look with the real talent on set until about 15 minutes before air time. It's not a real live production until some mission-critical unknown reveals itself until the last minute. This time it was the chroma key and virtual set. That and too much coffee while worrying made for a shaky lead-in to the best live offshore powerboat race TV coverage ever. Preparation paid off. Everyone and everything performed admirably. This story is dedicated to the memory of Wendell “Wink” Friesen, owner of Wink AV in Hutchinson KS, our NewTek Dealer, trainer and good friend. Wink spent part of his last afternoon helping us work through set-up issues for the next day’s show by phone. He died unexpectedly at his home that night. Wink always said the answer to 90% of our questions was right in front of us. He was right.